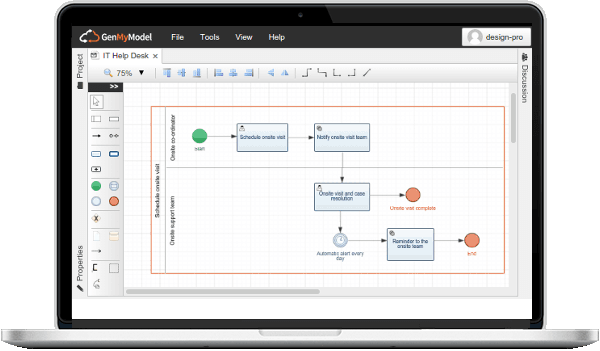 Analyze, document and share your business processes and data with GenMyModel, an entirely web-based modeling platform. You need to improve and document your business processes? Your information system and data are crucial? Align business and IT teams with a single modeling platform. Empower collaboration and get all stakeholders on-board with a collaborative BPMN 2.0 model editor. Design business processes with an incomparable ease of use, there's no learning curve to get started in the editor. Depending on your role - business process expert / owner / manager or participant - you can choose the appropriated level of details in your BPM diagrams. Mutual understanding and collaboration are key to achieve business process improvement and transformation. Having a single modeling platform to depict processes, data and the underlying software architecture helps close the gap between IT and business teams. GenMyModel enables seamless collaboration between both worlds. Once modeled in GenMyModel, automate your business processes with any standard workflow execution engines. We contribute to the OMG Model Interchange Working Group (OMG BPMN MIGW) to ensure the interchange between our platform and execution engines. Custom application development may be necessary to support your critical business process. In this case, as a full-featured modeling platform, GenMyModel provides code generators to help IT teams save time. Our technology enables IT engineers to generate parts of the business apps in any framework and languages. We know what it takes to tackle design challenges. Our amazing R&D team continuously improves a unique modeling experience on the web. Here are some of the big players who trust in our technological advantages.